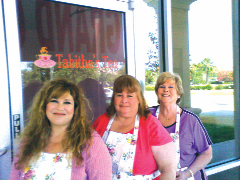 Tabitha’s Tea Room, located in Brandon, is run by Lori Madonna Mincey, her sister Gloria Madonna and their mother, Barbara Madonna. “It’s was all Tabitha’s fault,” the women chimed in when asked how they got into the tea business. Tabitha is the daughter of Lori Madonna Mincey, one of three owners of Tabitha’s Tea, along with her mother and her sister, Barbara and Gloria Madonna. The ladies say they had traveled the state taking Tabitha, now 17, to different tea rooms before opening their own in May of this year. Tabitha’s is a proud member of the Greater Brandon Chamber of Commerce (GBCC) and has participated in Bell Shoals Baptist’s annual Giving Hope Through Faith fundraiser. On Saturday, October 29, it will host a local author for her booking signing. Other events hosted at the 2,000-sq.-ft. pink painted palace include bridal and baby showers, birthday parties as well as business lunches, holiday parties, ladies church groups and more. Within the four separate dining rooms is seating for nearly 40 people to enjoy the more than 50 teas Tabitha’s carries, including black, green, white, fruits and herbal, decaffeinated and approximately 10 organic teas. In addition to the tea selection, Tabitha’s offers afternoon tea ranging in price from $8 for a dessert tea to $21 for the Gentleman’s or the Queen’s tea. The Gentleman’s Tea comes with two “oversized” tea sandwiches and the ladies have been surprised by the number of their male clients. “We want men to feel comfortable here,” Barbara said. Besides the afternoon teas, Tabitha’s also has artisan sandwiches crafted on fresh baked bread with Boar’s Head meats, salads and soup, including its signature soup – the tomato bisque, homemade by Barbara. In fact, Barbara makes everything from scratch everyday- with the exception of the chicken salad, which Gloria creates with grapes and toasted almonds. Tabitha’s is open 11 a.m.-5 p.m., Tuesday-Saturday and is available on Sunday for parties of 10 or more. During the Tuesday lunch hour, local musician Mike Mabry plays relaxing live instrumental guitar. For more information, please call 438-8901, visit www.tabithastea.com or ‘like’ them on Facebook at www.facebook.com/TabithasTea. If you check in at Tabitha’s via Facebook, you will receive 10 percent off your total bill. Jennifer is the Assistant Editor at the Osprey Observer, having climbed the corporate ladder from intern in 2007. She graduated from the University of South Florida with a bachelor’s degree in Mass Communications. She lives in Channing Park with her husband, Eric, and their two dogs.